Marine iguanas feed on algae at low tide and can submerge up to 20 meters (60 feet) and spend more than 60 minutes underwater. They are descendants of land iguanas of South America. Marine iguanas can live for 25 to 30 years and can grow up to one-meter length. The Galapagos marine iguana (Amblyrhynchus cristatus) is one of the forty species of iguanas on the planet. They live exclusively in the Galapagos Islands (endemic species). Marine iguanas can dive 25 meters underwater and stay up to 10 minutes diving, but you can also see them sunbathing near rocks, reaching a body temperature of 35.5 ° C. When the body temperature drops too low they have difficulties to move, which makes them vulnerable to predators. Marine iguanas become also more aggressive when they are colder. Given that marine iguanas spend much of their lives diving, we don’t know yet many things about them. Did you know that marine iguana sneezes through the nose? This unusual adaptation has evolved to get rid of the excess of salt they eat in their marine diet. Aboard Fragata Yacht, you will be able to see some of the most incredible and unique animals in the world. 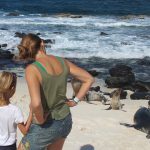 We have arranged exclusive itineraries, so you can enjoy Galapagos at its best. 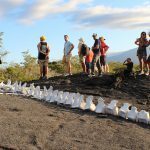 Galapagos is a place you should visit once in your life, don’t miss this amazing opportunity! For further information, feel free to communicate with us, we will be happy to help you.